Don’t let the above screenshot fool you. This is not your typical 16-bit-esque action game with slow physics and various other engine restrictions. Quite the opposite in fact, as CrossCode brings fast-paced combat and animations simply not possible on ye olde 16-bit console. Throw a rather lengthy story in an absolutely massive world on top of that, Zelda-esque dungeons and a wide variety of enemies to destroy, and you’ll have an idea of what awaits in this stylish RPG (hint: a groovy time). But first… let’s go back to 2013, which is when my initial coverage of CrossCode was published. Game sure looks different today, eh? From that meager tech demo’s humble beginnings, developer Radical Fish Games has put in a lot of effort and it’s immediately apparent. Based on the trailer (below) alone, I’d say a grand adventure for its mute protagonist, one with a multitude of deadly boss battles, puzzle-filled dungeons, new allies (and enemies), an in-depth upgrade system (remember, it is after all an RPG) and… well, according to its creator, the entire thing should last some “30-80 hours”. Wow. Be a proper avatar and master all 4 elements: Cold, Heat, Shock and Wave. What, those are not the right elements? No idea what you are talking about. That might sound like a lot, and if the gameplay shown in the trailer is any indication of what lies ahead in CrossCode, I’m definitely excited to give this game a proper go. Also, its price tag – while slightly higher than most indie games nowadays – does seem justified, given the amount of content and fun times this one seemingly has. So much loot, so much asskicking to do, so much strange, quirky, sci-fi story to experience, and… so much fun to be had. 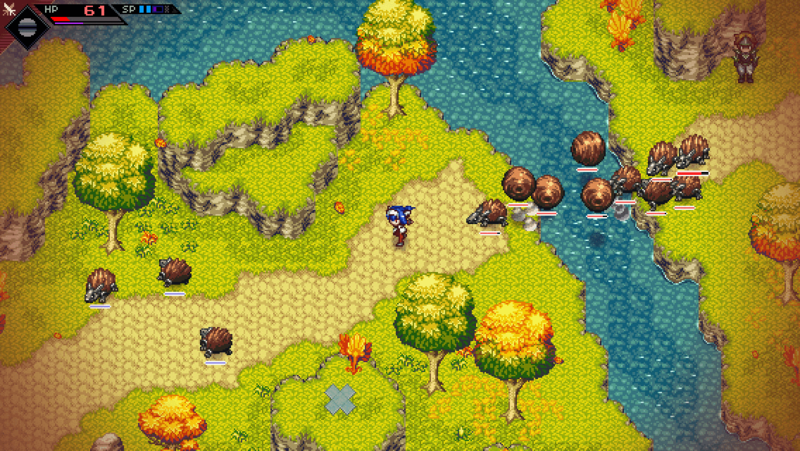 Oh, and it’s out of Early Access, so now’s definitely the time to pick up and play some CrossCode! CrossCode is available from Steam, Humble Store, GOG.com, Green Man Gaming, itch.io, and Game Jolt, carrying a $19.99 price tag.